To request a private hire, please see the conditions below and then click here to access the online request form. 1. 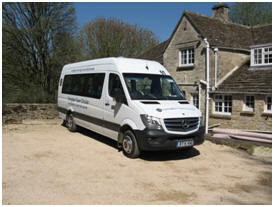 General - The Community Bus is only available for private hire with an FCB MIDAS trained volunteer driver. The bus can carry 16 passengers but is not fully accessible i.e. it does not have a tail lift or ramp. Folding wheelchairs and walking aids can be accommodated but stowage of these may reduce the number of seats available. All passengers must be able to enter from the pavement and ascend one internal step to the otherwise flat floor. Your Hire is not confirmed until your Booking Fee and Minimum Distance Charge have been received by FCB. 2. Availability - The Bus will generally be available for hire, subject to the availability of an FCB driver, to local individuals, clubs, charities and organisations in and around Faringdon on weekday afternoons and evenings and Saturday and Sunday all or part day. It will not be available at times that conflict with the operation of the published service timetable, trips and prior bookings. · If a booked and confirmed hire has to be cancelled by FCB before the Hire takes place all payments paid to FCB by the hirer will be refunded. · If a hire fails to reach its destination, due to circumstances beyond the control of FCB but within the responsibility of FCB eg failure of the bus, all payments paid to FCB by the hirer will be refunded. · If a hire fails to reach its destination, due to circumstances beyond the control of FCB, accident, road closure, weather conditions, payments already paid to FCB by the hirer will not be refunded but no further payments for distance travelled will be due. · In none of the above circumstances will FCB accept liability for any secondary losses suffered by the Hirer eg non use of booked tickets, in the event that the destination is not reached, or reached in time, due to any unforeseen circumstances. The Hirer shall ensure that sufficient time has been allowed for the journey. 3. Enquiries (or to make a booking). Please complete our online booking questionaire which will enable us to fully understand your requirements and to provide a quotation. Alternatively please eMail fcbhires@mail.com . We will respond as soon as possible. 4. Legal Requirement - In order to hire the Community Bus, the Individual requesting the Hire, is required to be a registered hirer of Faringdon Community Bus. This is a legal requirement and enables FCB to hire the bus to third parties and avoids the need for the hirer to obtain their own transport permit. 5. Hire Charges – All charges include VAT at the ruling rate at the time of booking. *The Fuel Charge will be calculated at the rate above for every mile travelled. The rate is established from actual mile/litre consumption values. The forecourt price will be that applying on the day of the hire. Seat belts must be worn. No fast food, drinking from glassware, alcohol or smoking is allowed on the bus. The First Aid kit is for emergency use. The Hirer will be charged for the replacement of any item used. The bus is a Community asset and shall be treated accordingly. The FCB driver has absolute right to refuse conveyance to any passenger not complying with the rules or whose behaviour is unacceptable. The driver will have a copy of your Hire Booking Form in the bus. The driver will complete a Log Sheet in the bus recording the mileage travelled, no. of passengers and finish time. To hire the FCB see Contacts for name and telephone number and Booking form link.